The Samsung handset range offers a great selection of technically advanced, easy-to-use, ergonomic terminals, suitable for use with Samsung OfficeServ communication solutions. 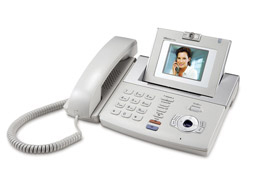 Selected Samsung OfficeServ handsets are available in either digital or IP-enabled configuration, providing identical features and functionality to the user whether they are connected as traditional handsets, as IP devices on the network infrastructure or remotely via external data connections, such as DSL. Each of the phones offers superior audio quality and high resolution displays.